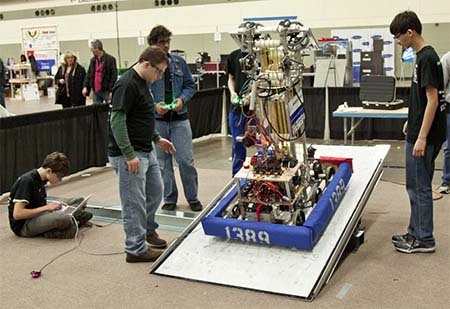 RoboZone, a new series about high school robotics teams in the state, will debut on TV channels across Michigan in March. “RoboZone is a natural extension of our network’s focus on the high school experience, (and) the competitive spirit among the emerging generation of new leaders, not only in sports, but in business and technological innovation as well,” says Mark Rottenberk, regional sales manager at The State Champs Sports Network, the developer and producer of the series. The network, a division of Yellow Flag Productions in Bloomfield Hills, is a producer of media that focuses on high school sports. The company also produces the High School Sports Show on Fox Sports Detroit. The RoboZone series opener will preview the FIRST Robotics Competition, a national contest that kicks off this weekend in the state. Michigan has more than 350 teams competing this year, and more than 73,000 students compete nationwide. Teams of 25 students or more build and program robots to perform certain tasks, and then compete against other teams. The TV shows will chronicle six district competitions throughout Michigan. The final show will follow competitors during the four-day State Championships in Grand Rapids. RoboZone will debut on Sunday and be broadcast locally on CW50 Detroit (WKBD-TV).